Many of you have probably already noticed the jailbreak server received an update of much needed changes, fixes, and features today. I'll go over some of the larger items in the list. A complete list of the jailbreak servers changelog can be found here. The warden has had an auto-muting feature for quite some time now that would automatically mute all other players while they speak on the microphone. I would say most people weren't really aware of how this feature worked and some weren't even aware it existed. Basically when the warden speaks on the microphone they have a set time where everyone will be muted while they speak. Everyone is unmuted if the warden holds their microphone key down longer than that set time, and the longer the warden holds the key down the longer they have to wait to mute everyone again. It seems a lot of players thought the wardens auto-muting would last forever which simply isn't the case. Because of the lack of awareness I decided to make a visual representation of how this feature works in something I named "Mute Power". Now the warden can easily see if they will mute others and can judge how long they should hold their talk key down, which might help prevent some of those annoying wardens from queuing their microphone forever. A new command has been added for all level admins that allows them to easily give a freeday to any prisoner. The command is !freeday and when used on a player it will display a menu for them with a list of all of the available last request freedays. 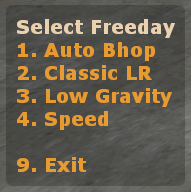 When the target player selects a freeday from the menu it will automatically respawn that player if they are dead and put them in their selected option. These admin given freedays will behave exactly like a regular last request freeday, and they are removed when the real last requests start or when the round ends. Admins no longer have to deal with the tedious work of managing freedays the old fashioned way. The number of last requests available are now calculated when the round first starts. This should stop the confusion of not knowing how many last requests are supposed to happen, especially with the new !lrs command that flat out tells you the number. May the teamswitch exploiters be a thing of the past. If you think the warden queue is broken now I can assure you it isn't and has just been changed to work differently. The primary warden queue has been modified so instead of selecting from the queue every single time a new warden is needed it will instead only select from the queue for the first warden of the each round. All of the other times a warden is selected it will use a secondary queue which players have no control over. The secondary queue is sorted by who joins the guard team first and when a warden is selected from it they are then readded to the end of that queue. The jailbreak server can get very hectic with so much happening at once and because of this the servers performance can easily go down the drain with many players online. I spent some time this week benchmarking the plugins and optimized quite a few of them. A few of the biggest offenders have been optimized on my local testing server but they can't go live until some other of my other work is completed first. The !hide plugin was also removed as it chewed up more resources than I would have liked. I would like to hear your thoughts on !hide being removed for good versus it being a critical plugin for the server to have. You will also notice the servers tickrate is now 56.9 down from 64. A lot of people have already questioned me about this change so I'll go ahead and explain it here as well. Going down in tickrate is actually better for the server (and players) performance when there are many players online. The server has a hard enough time keeping a stable 56.9 framerate let alone 64. When the servers framerate dips down too low you will start seeing your net_graphs sv spiking hard in the red and then your performance as a player goes down hill. TL;DR is you probably don't know what you're talking about when it comes to tickrate and higher numbers don't equal better performance in environments like this. The truth of the matter is the jailbreak server could probably easily be played enjoyably on an even lower tickrate but everyone would go up in arms. Anyway, the servers framerate is improved now and the sv doesn't spike as high as often as it was. The other day I whipped up a plugin to help prevent players from spamming text. I'm sure some of you have already seen the spam warning messages, but for those of you who haven't just know such a system is in place. If you ignore the warning messages and continue to spam the plugin will go ahead and automatically gag you for the remainder of the map. This plugin was added to every server. That about sums it up for this news post. Be sure to check out the link above for the complete jailbreak changelog if you haven't already. Please share your thoughts on the !hide command or anything else you think needs brought to my attention. I love the new update! Great work Hl! Like the change. Change means good. Hope everyone likes the new changes and adapts quickly. God I love you so hard. Very nice update! Thank you Hl!